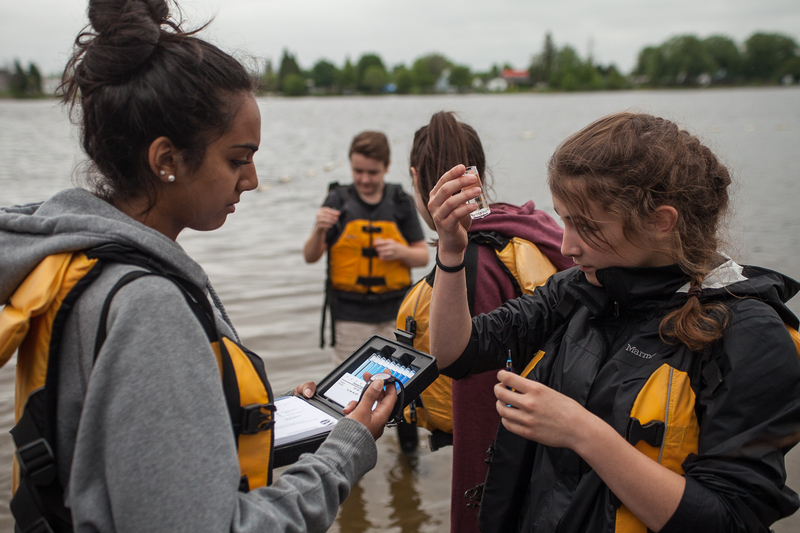 A group of young citizen scientists test water quality. Kat Kavanagh is the co-founder and executive director of Water Rangers, a citizen science project that brings education and water quality testing to the public. The Ingenium Channel sat down with her — over the phone, as she was away doing water testing at her cottage — to learn about Water Rangers and what it means to be a citizen scientist. Ingenium Channel: What is Water Rangers and what is your role? Kat: Water Rangers is a citizen science platform for water. We’re trying to give the average person access to water quality testing, either through viewing existing data, or by having the ability to add in their own observations and data. It was founded in 2015 by myself and Mark Dabrowski, and I’m the executive director. Kat Kavanagh, co-founder and executive director of Water Rangers. Ingenium Channel: How did Water Rangers start? Kat: It all started when we participated in Aquahacking in 2015. The challenge is to come up with ideas to help transform resources for local water bodies – our year was for the Ottawa RiverKeeper. I was sort of “scratching my own itch” because I do water quality testing with my Dad. I wanted to create a platform where we could view that data and get lessons to understand it, as well as being able to share it with everybody. We decided on the idea of creating a really quick way for anyone to feel empowered to be as part of water stewardship in a way that wasn’t a drag, and to make it fun, make it engaging. Ingenium Channel: What is citizen science, exactly? Kat: Ouh, yeah that’s a good question, I like it [laughs]! Citizen science is science that is accessible to everybody. It means that more people can participate. The purpose is not just to collect data, it’s also to educate and engage the public. To me, it has to be an accessible format – you need to make sure the language and the tools are affordable, accessible, and easy to understand. Ingenium Channel: What is open data and why is it important? Kat: Open data is a growing movement that makes data is accessible to everybody. The movement is striving to open up existing data that, say, the government or that other citizens have collected and putting it online so that it can be accessed by everybody. The cool bit about open data is that data that has been collected for one purpose can be recombined with other data that has been collected, and it can be used to gain insights that we wouldn’t have had otherwise. We talk about being data-rich and information-poor, so citizen science and open data are ways we can really uses data in a new and innovative way. Ingenium Channel: You’re so passionate about your work – why do Water Rangers and citizen science matter so much to you? Kat: I’m a web designer and I design experiences for people on the internet. About three years ago, I was looking for a way to make my mark on the world and make the world a better place. I wanted to combine my love of science and my desire to make usable, fun experiences on the web – Water Rangers is that vehicle for me to do those two things together. The best thing for me about Water Rangers is that I meet all of these incredible people who are so passionate about protecting waterways, and I can give them the tools they need to do a better job and engage with more people. We started the testkit program two years ago, and then last year I combined it with a little bit of a study on behavior to see how water testing changes behavior. We have some really cool stats: 92% were asked by bystanders what they were doing, and 85% taught others how to conduct water quality tests. There were all sorts of other things that happened when they tested, like they visited water more frequently. People said that it became their excuse to visit more places when on holiday. Along the way, they ended up doing things like picking up garbage or doing bioblitzes (editor’s note: bioblitzes are a short period of intense wildlife recording). It became a mechanism to get them more involved in water stewardship. We’re trying to link up with the universities for our data as well, so they can use it for their scientific research. Climate scientists especially are very interested in citizen monitoring because they need big data sets. But it’s not just the collecting of the data that matters: it’s also how it changes perceptions and attitudes of people. There’s a whole bunch of research that shows that it’s usually from the grassroots, from the people, that real policy change happens because the public demands it. It’s kind of a sneaky way to change the world through changing people and their relationships to water. Ingenium Channel: How can I get involved? Cassidy is a student of biology and communication at the University of Ottawa. She works for the Canada Science and Technology Museum’s Visitor Experience team, bridging the communication gap between science and the public. When away from her (amazing) job, she is travelling, performing or attempting to keep plants alive in her apartment.